Don't Eat the Wild Mushrooms! Have you ever seen one of those survival shows where the host eats a handful of wild mushrooms to stay alive? Are you tempted to try it yourself? What you don't see when you watch these shows is the botany expert with the PHD in biology behind the camera carrying his trusty encyclopedia of edible plants. 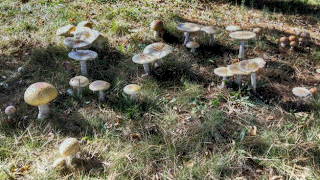 To the untrained eye, many types of mushrooms and plants are indistinguishable. One bad mushroom might be all it takes to kill you on an empty stomach. If you're ever lost in a forest for a few days, you are much better off eating bugs. Earthworms, termites, grasshoppers, and crickets are all completely edible and high in protein. Most people can go for a week or two without food anyway. I could probably go for two months on body fat alone, and that's not a joke. When in doubt, its better to tough it out for a day or two and avoid the plant or mushroom that could potentially kill you. No matter what anyone on TV tells you, stay away from the wild mushrooms.